According to the new Music 360 2015 report, Nielsen’s fourth annual study of U.S. music listeners, 91% of the national population listens to music, spending more than 24 hours each week tuning into their favorite tunes. While total listening figures are roughly the same as last year, the report shows changes in the ways people access music. 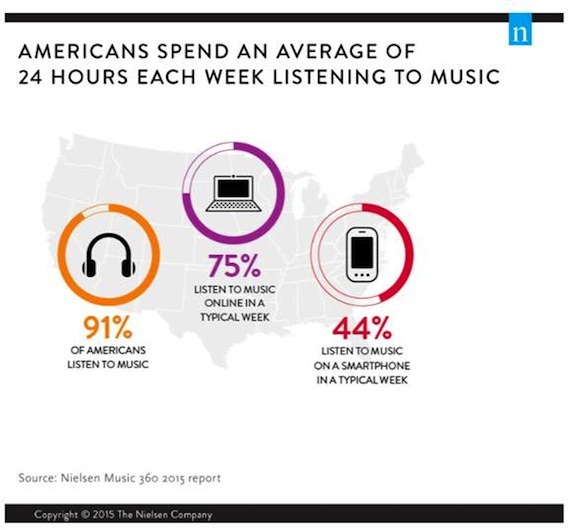 75% of Americans listen to music online in a typical week, up nearly 12% from last year. While Americans streamed more than 164 billion on-demand tracks across audio and video platforms in 2014, they streamed 135 billion in the first half of 2015 alone, up more than 90% from the same period last year. Music listening is becoming more mobile, with 44% report using smartphones to listen to music in a typical week, a 7% increase over last year. Listening on desktop computers decreased. Radio continues to be the No. 1 source of music discovery in the U.S, with 61%. Word of mouth is also important, particularly for teens (65%). 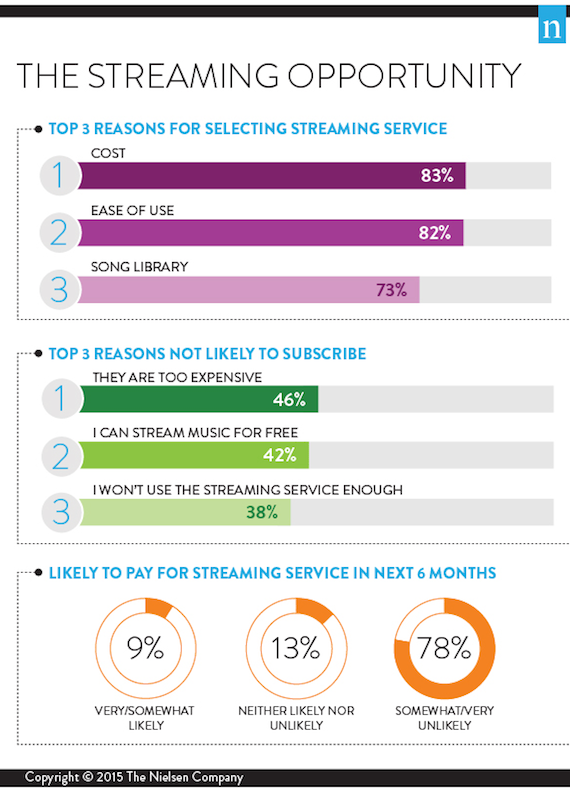 Twelve percent of respondents say they discover music through live events, up more than 70% from last year. Americans spend more than half of their music related expenditures on events each year, and 50% of Americans say they’ve attended a live event in the last year. Eleven percent of Americans have attended a music festival in the past 12 months, with Millennials comprising 44% of all festival goers.